Battlefield V's maps take players from snowy Norwegian peaks to the devastated streets of Rotterdam. As Battlefield V gets closer to its November launch, which might be earlier or later in the month depending on your Origin Access subscription status, publisher EA and developer DICE are releasing more and more information about the upcoming World War 2 FPS. After a trailer focusing on its single player War Stories and a proper look at the roadmap for the first months after launch, the latest trailer focuses on the title's multiplayer maps. Battlefield V will launch with 8 maps and its Open Beta already acquainted us with two of them, showing off the airborne invasion of Narvik and urban combat in Rotterdam's streets. They both have companion maps in Fjell 652 and Devastation. The former has players duking it out on top of a mountain, in a battle that involves infantry, aircraft and "extreme dynamic weather". The latter takes us through Rotterdam after the devastating bombings, continuing the urban warfare theme. Hamada, the largest of the maps available on launch, moves the action to North Africa, emphasizing tank battles in the desert, while Aerodrome takes place in a ruined Axis airfield. Lastly, Battlefield V sends players to France. Twisted Steel, also seen in the original announcement trailer, takes place in "a flooded marshland dominated by a monumental partly destroyed steel bridge" and incldues the full combined arms experience. The bridge is said to be the largest structure seen in a Battlefield game. Arras focuses on a small town surrounded by fields and trenches. As you've probably noticed, the maps come in pairs in terms of location. This happens because of the Grand Operation modes, as different maps will serve as battlefields for the operations' different days. 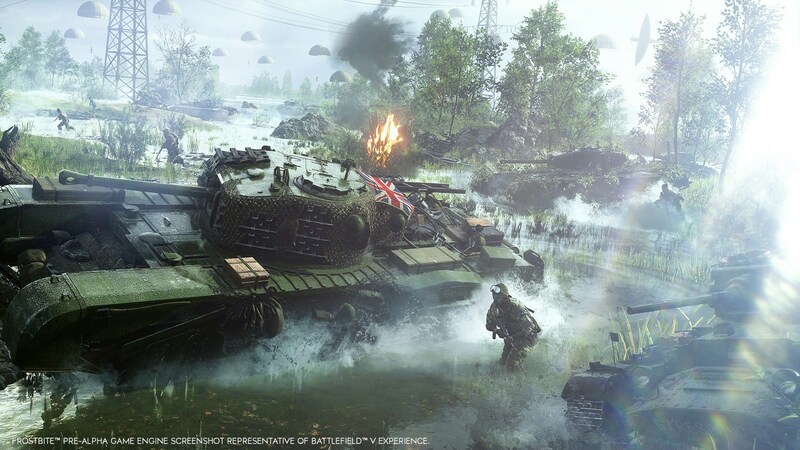 The trailer also gives a glimpse at Panzerstorm, the first post launch-map. Set in the Belgian countryside, it takes inspiration from the first major tank battle of the war. Battlefield V is set to launch on November 20th on PS4, Xbox One and PC. Origin Access Premier subscribers get access to the title on November 9th.